While JEANRICHARD’s watch-making DNA is deeply rooted in the Swiss watch manufacturing tradition, its spirit is clearly influenced by Italian culture. Owned since 1988 by Luigi Macaluso, President of the Sowind Group, the brand is currently headed by one of his sons, Massimo Macaluso. Both of them have a shared passion for art and design, and have succeeded in infusing JEANRICHARD with a touch of fresh spontaneity and originality, that today enables the brand to stand out in a refined and elegant way among the most prestigious watch brands. MV Agusta is a legendary name in the motorcycling world. It has in particular dominated international racing for many years, winning no less than 75 world championship titles. 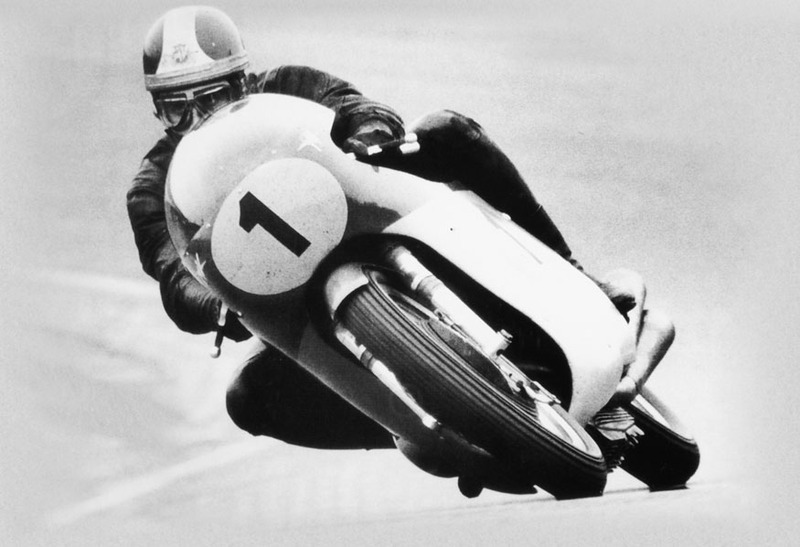 MV Agusta’s 12 victories in 1956, as well as John Surtees’ triumph in the 500cc world championship earned MV Agusta its International notoriety. It was however in the 1970s that the brand reached its peak with star driver Giacomo Agostini, who dominated motorcycling competition for almost a decade in the 350cc and 500cc categories. Above and beyond this impressive track record, MV Agusta is chiefly renowned for the refinement and aesthetic appeal of its prestigious motorcycles, now developed in the CRC research centre. It is this same centre that develops highly exclusive models especially designed and produced in limited series. Far more than even style, it is the shared passion for mechanical engineering precision that is the prime common denominator between JEANRICHARD and MV Agusta, as both brands are wholeheartedly involved in developing their heritage and know-how. With the launch of its JR1000 calibre in 2004, JEANRICHARD joined the select circle of watch companies producing their own proprietary movements. Meanwhile, production of the engines and frames, as well as assembly of MV Agusta motorbikes was being handled at the company’s manufacturing sites in Varese, Italy. “Brutale”, an Italian word synonymous of extreme virility and power, is the name given to one of the two emblematic lines of MV Agusta motorbikes. JEANRICHARD’s “Chronoscope” collection adopts these same codes. In the same way as the models introduced in 2008, the “Chronoscope MV Agusta Brutale Nera” is inspired by the emblematic elements of the Brutale motorbikes, and embodies to an even greater degree the extreme virility referred to above. With its sportive and extremely masculine design, the watch features JEANRICHARD’s famous hand-decorated in-house manufactured movement JR1000, which can be admired through the smoky transparent decorated case-back with the MV Agusta logo. The generously-sized case (43 x 43 mm) of this limited edition of 290 pieces is entirely covered in rubber. The stamped dial mimics the design of a motorcycle wheel rim and is composed of a single element, with a raised chronograph as markers to accentuate the visual idea of depth. The chronograph’s counters reflect the sportive aesthetics of the instruments on a motorcycle dashboard. The subsidiary seconds’ zone located at 3 o’clock, with its rotating disk and Arabic numerals, adds to the watch’s aggressive design; so does the use of the red colour on the dial. 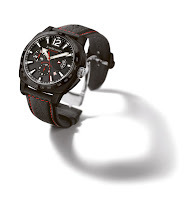 The bezel, push-buttons and case-back are in black PVD coated titanium, the crown in titanium. A tachymeter has been added to the bezel. The push-buttons have been designed to fit the shape of the case, making the watch extremely comfortable to wear. The calfskin watchband has visible red stitching and is attached to the case with a special insert system. Limited series of 290 numbered watches.